About Us - Kids Smile Inc. The Kids Smiles mission is to provide children in under-served communities with preventive and restorative oral health care as well as innovative health education programs, focusing on the prevention of dental disease and the development of positive, personal health behaviors. Learn more about the Kids Smiles mission and our work in the video and timeline below. 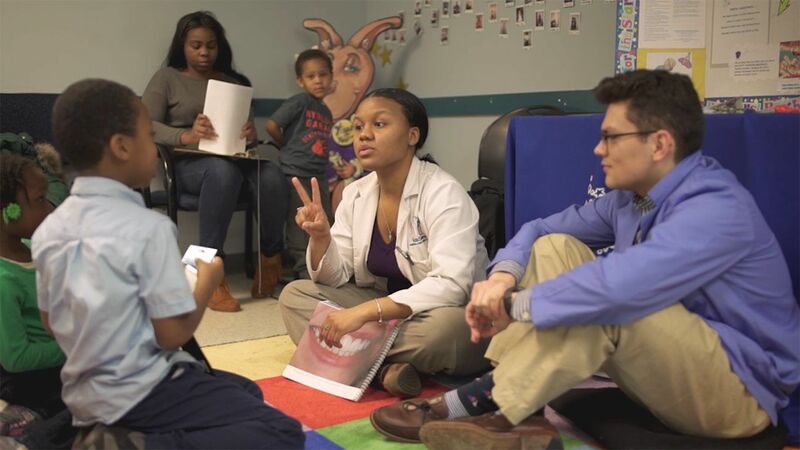 The award winning Kids Smiles mission is born: Dr. Joseph R. Greenberg, Founder, shifts his vision into reality of bringing dental care and health empowerment programs to under-served children. Kids Smiles flagship dental center opens in Southwest Philadelphia with 5 employees and no patients. The formal Kids Smiles Education & Outreach program is launched with a full curriculum to serve both children and parents in dental center waiting rooms and in the community. Kids Smiles launches its signature fundraising event the “Open Wide” Golf Classic and Cocktail Party. Cheryl Janssen is named founding Executive Director and tasked with opening the first dental center. She also develops and implements the outreach program to provide dental screenings and dental health education for schools in the surrounding community. Kids Smiles’ dental center reaches 17,000 patients and a second location is opened in West Philadelphia to meet the growing need. Kids Smiles expands services to Washington D.C. Kids Smiles reaches 73,000 children since opening and kicks off the Sweet Sixteen Capacity Building Campaign to raise funds to expand programs and services to more children and families.